Even though it is still very hot and sunny outside, I am dreaming of fall already as I drool over these lovely golden cosmetic goodies. I have tried some of these little savvy products already as I refuse to wait for fall arrival in sunny California. 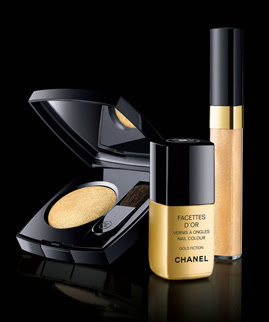 I have not had a chance to pick up these Chanel beauty products in gold but I am very anxious to try them at the first opportunity. I swear by Chanel lip gloss and nail color so these items have my name on them already. Besides, a little Chanel luxury for $20 to $50 is very savvy. A little gold on a gal's face and nails just add a dash of savvy and glam, giving the impression of a golden girl. 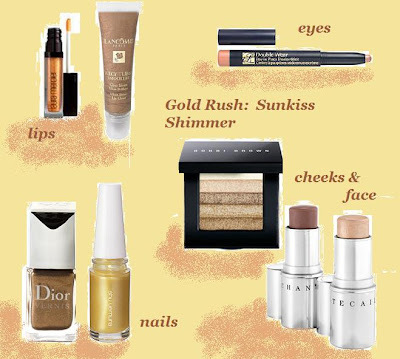 These are my picks for Fall Must-Have beauty products. Top, left to right: Laura Mercier or Lancome for lips, and Estee Lauder Shadowstick for eyes in gold or bronze. I have personally used Estee Lauder Shadowstick in gold already, and I adore it. It can be use as a thick eye liner or smear with finger tip to create eye shadow, add a layer of mascara and I am done with the bare make-up look! Bottom, left to right: Dior and Shu Uemura nail color. I have applied Dior nail polish in gold/ginger on my nails and the result is warm and flattering. Cheek/face color by Bobbi Brown and Chantecaille, both will definitely add a touch of golden shimmer to the cheek thus achieving a faux golden glow without the sun. So is gold savvy for you? If yes, what are your favorite products? The nail polish looks good!! I'm not a big gold gal, but I'm trying to get into it. Thanks for sharing your story - at least you could quickly change from the bird poop clothes! I'm not that into these shades. I think they would look good on other people though. gold nailpolish and gold eyeshadow is definitely hot.. gold lip color on me.. would most likely be a not though. I prob wouldn't do all gold together, else I may look like the Oscar statue but as an accent it will be very savvy. i like the dior nail polish and bobbi brown brick.